The HP-75 came standard with a magnetic card reader and an HP-IL interface. The HP-75 could use magnetic cards for mass storage as well as a tape drive and disc drive, using the HP-IL interface. The tape drive and disc drive were cumbersome in a portable environment (and expensive). The magnetic card reader was very limited. Each card could only hold 1.3KB of information. Many programs for the computer which were stored on magnetic cards required a double pass of numerous cards, which was inconvenient. The magnet cards were also less reliable than tapes and discs because it was easier for the magnetic surface to become dirty. The magnetic surface was cleaned by swiping it with a cotton ball soaked in isopropyl alchohol. Our experience at the museum has been that every sixth or seventh card requires an alchohol swipe to be readable. The good news is that we have not yet come accross a card that we couldn't read by giving it a good swipe or two. In our opinion, the key feature of these computers with respect to mass storage was that they came with non-volatile memory. Since most users only ever needed a few specific programs, these programs could be loaded into memory, where they would reside indefinitely (unless the batteries failed). The HP-71 did not come standard with either a card reader or HP-IL interface (and was about half the price of the HP-75). 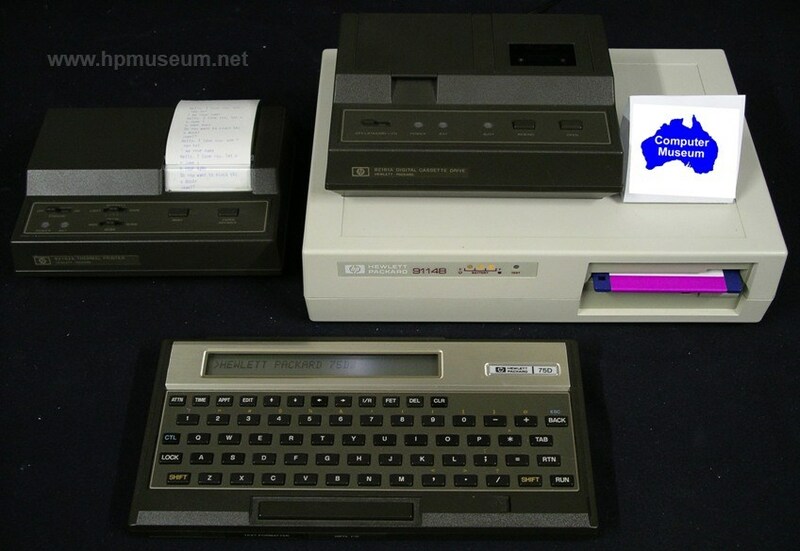 Both the card reader and HP-IL interface were options for the HP-71. The cards used for the HP-71 were the same as those used by the HP-75. However, these computers were not program compatible. They each used a different version of BASIC. So, programs written for either computer could not be used on the other computer. Please contact us if you have any software on disc, tape or magnetic strip for the HP-75 or HP-71. Our collection of software for these computers is stored on 3.5 inch DS/DD floppy discs, for use use in a 9114 disc drive. Since the capacity of these discs is 720 KB, it is likely that a single disc could hold most of the software ever written by a user for one of these computers. We have listed our archived titles separately on the web site. However, we have stored three to four titles on individual discs. The descriptions for each software title explain the full contents of the download file. The web's best source for user-contributed software for these handheld computers (including the HP-41) is here. These products were developed and manufactured at HP's Corvallis Division.